Professor Marina (Nina) von Keyserlingk was recognized by the Hans Sigrist Foundation at the University of Bern with the 2018 Hans Sigrist Prize for her outstanding academic contributions in the field of Sustainably Produced Food of Animal Origin. “The search committee was unanimous in recognizing that she is truly outstanding when compared to others working in the same field,” said committee chair Professor Rupert Bruckmaier, Head of Veterinary Physiology at the University of Bern. Von Keyserlingk accepted the award at the annual Hans Sigrist Symposium and at the University-wide formal awards ceremony on December 1. 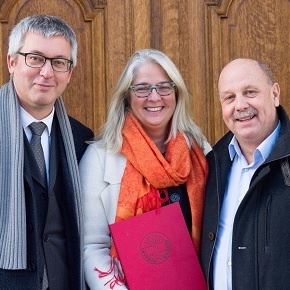 She is pictured above, with Professor Norbert Trautmann, President, Hans Sigrist Foundation, University of Bern on her left, and Bruckmaier, Hans Sigrist Prize search committee chair, on the right. The foundation awards the Hans Sigrist Prize in the form of a 100,000 CHF research grant (approximately CAD$130,000) to a mid-career academic researcher to recognize research contributions to date and to encourage further outstanding work. Award winners represent a variety of academic fields; each year’s prize field is different, based on proposals considered by the foundation’s board. Von Keyserlingk joined UBC’s Animal Welfare Program in the Faculty of Land and Food Systems in 2002 as the group’s third faculty member. She was appointed as an NSERC Industrial Research Chair in 2008. Today, with her colleagues, she leads a strong group of students, post-doctoral fellows, visiting researchers and adjunct professors that now make up one of the world’s foremost research groups in the area of animal welfare. She is recognized internationally for research on the care and housing of dairy cows and calves. She has been a pioneer in the use of behaviour (including especially automated measures) for the early detection and prediction of disease in animals. This work has focused on the use of changes in feeding and social behaviour as early indicators of disease, and has provided a basis for the rapid growth in new research focused on automated health assessments on farms. Her work is also among the first in the field of animal welfare to incorporate qualitative methods when addressing animal welfare issues, such as interviews, focus groups and online crowd sourcing tools to understand perspectives of farmers, veterinarians and the public. This work has motivated scientific research better targeted at perceived constraints and illustrates a new trend towards interdisciplinary research to address societal concerns around animal agriculture. Awards received by von Keyserlingk include the Killam Teaching Prize in 2008 for outstanding contributions to teaching at the undergraduate and graduate levels in the Faculty; the American Dairy Science Association’s DeLaval Dairy Extension Award (2018); co-recipient (with her colleague Professor Dan Weary) of the World Buiatrics Ruminant Well-being award; and the Elanco Award for Excellence in Dairy Science (2013), among others.